MSNBC's Richard Lui reports on the massive fuel outages following Hurricane Sandy. Updated at 1 a.m. Friday ET: Hundreds of thousands of people in New York City, Long Island and New Jersey may not have power restored for up to 10 more days, officials warned Thursday. Meanwhile, weather forecasters said a winter storm could hit the Northeast next week. Meanwhile, FEMA and the National Guard dropped off diapers and water in the Bronx, where there has been no running water or electricity, NBC New York reported. Residents there said that people had broken into a supermarket to steal water and that the streets had grown dangerous. Without electricity, there's no light, and without cell service, there's no way to call for help. In New York City, the utility ConEd said the 228,000 customers in Manhattan still without power should have it back by Saturday, but that would leave more than 400,000 elsewhere potentially in the dark beyond Saturday. In a statement Thursday, ConEd said it hoped the vast majority of those would have power by Nov. 11. The areas taking the longest, spokeswoman Sara Banda told NBCNews.com, are those with overhead lines. "It's taking a bit longer," she said, noting that crews have had to deal with 100,000 downed lines. As for the potential for a new storm, Banda said ConEd has a team dealing with weather scenarios. "We're going to have to take that into account," she said. ConEd also noted that many buildings in areas with restored service will continue to be without power until they repair any flood damage to their own electrical systems. Millions remains without power, and in some places it could be weeks before the power goes back on. NBC's Brian Williams reports. Temperatures this weekend in the New York City area were expected to dip to the mid-30s, and hover around 40 during the week. The outage outlook was similar along the Jersey coast as well as on Long Island, where 60 percent of homes were without power. The region also struggled with transit on Thursday, three days after Superstorm Sandy tore through. The promise of limited restoration of transit services lured hundreds of thousands back into the nation's largest city, but the commute was nightmarish even by New York City's standards: Seemingly endless lines at bus stops, backups at the city's bridges and tunnels stretched for miles, and many people simply gave up after an hour or two of frustration. Motorists sit in heavy traffic while crossing the Robert F. Kennedy Triboro Bridge Thursday in the Queens borough of New York. The scene was "pure mayhem," Lanisha Harris, who was trying to get to work in Manhattan from Canarsie, Brooklyn, told NBCNewYork.com. The order that all vehicles entering Manhattan must have at least three occupants appeared to cut down on traffic in the city, but enforcement of the directive caused problems elsewhere. 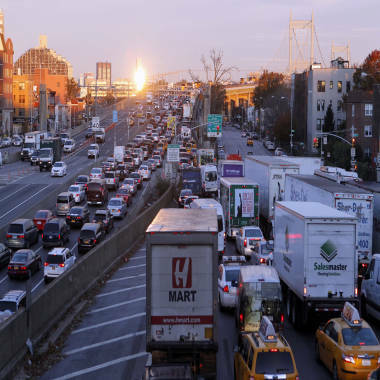 At the approach to the Lincoln Tunnel, traffic from New Jersey was restricted to a single lane and cars with fewer than three people were being diverted, causing a backup that jammed the state's northern highways. "Safety is our paramount concern, not convenience," Mayor Michael Bloomberg said Thursday in defending his order. Mayor Michael Bloomberg addresses issues with commuter congestion in Manhattan, as public transportation remains crippled, and warns New Yorkers that certain parts of the city may remain in the dark through next week. In downtown Brooklyn, "easily a thousand people, possibly more" were in line at the Barclay's Center Thursday morning waiting for public buses, NBC 4 New York reporter Kai Simonsen said from his helicopter viewpoint. That led some people to try to hitchhike their way into Manhattan, with drivers eager to pick them up to make the three-person-per-car quota. Bower walked into Manhattan instead, and then caught a bus uptown. Wednesday evening's commute out of the city was bad as well, leading Gov. Andrew Cuomo to declare that subway, bus and commuter rail services would be free Thursday and Friday. TODAY's Natalie Morales reports from Hoboken, N.J., where chilling new images capture communities utterly destroyed; meanwhile, thousands still remain trapped in the region without water, power or heat. After suffering the worst disaster in its 108-year-old history, subway services resumed at 6 a.m. ET Thursday on more than a dozen lines, supplemented by three bus shuttles. “There will be no subway service between 34th St. in Midtown and Downtown Brooklyn,” the MTA website said. LaGuardia Airport reopened but several hundred flights at the region's airports were canceled Thursday. Taxi companies pulled vehicles off the road as the fuel crunch deepened, with the vast majority of storm-hit gas stations in the greater New York area out of gasoline or power to run pumps. Open stations have lines with several hundred cars as well as individuals toting jugs to refuel generators. Downtown Manhattan was filthy -- from fish guts flowing down a street to untreated sewage in the Hudson River. Two brothers, ages 2 and 4, were found dead Thursday on Staten Island, where 19 deaths have been reported. Brandon and Connor Moore were swept away after their mother placed them on top of her SUV during the flood. Liberty and Ellis islands sustained serious damage, a source at the National Park Service told NBCNewYork.com. "The infrastructure is shot," the source said, adding that the docks and grounds were in "bad shape." While the Statue of Liberty and the museum at its base were OK, the source said, it would likely be "quite a while" before the islands reopen. In Jersey City, across the Hudson River from New York, drivers negotiated intersections without the aid of traffic lights. Lines formed outside pharmacies, while people piled sodden mattresses and furniture on sidewalks. The city has issued a curfew on people as well as a driving ban from 7 p.m. to 7 a.m. In the wake of the superstorm, people are banding together across New York City and New Jersey, offering power, food and even Halloween fun to their neighbors who have been devastated by wind and floods. NBC's Jenna Bush Hager reports. Most of New Jersey's mass transit systems remained shut down, leaving hundreds of thousands of commuters braving clogged highways and quarter-mile lines at gas stations. Power was still out to 4.5 million homes and businesses in 14 states -- and 3.2 million of those were in New Jersey and New York. Five massive U.S. military C-5s and 12 C-17s were flying 61 electrical repair vehicles from California to New York on Thursday to help stressed line crews. Sandy, meanwhile, dissipated over Canada. The storm killed more than 80 people in the U.S. New York City on Thursday raised its death toll to 38, including two Staten Island boys, 2 and 4, swept from their mother's arms by the floodwaters. Most of Sandy's flood waters on New York City's streets have receded, but much of the water beneath the streets remains trapped. TODAY's Savannah Guthrie met with Roger Less of the Army Corps of Engineers to talk about the task of drying out the underground. 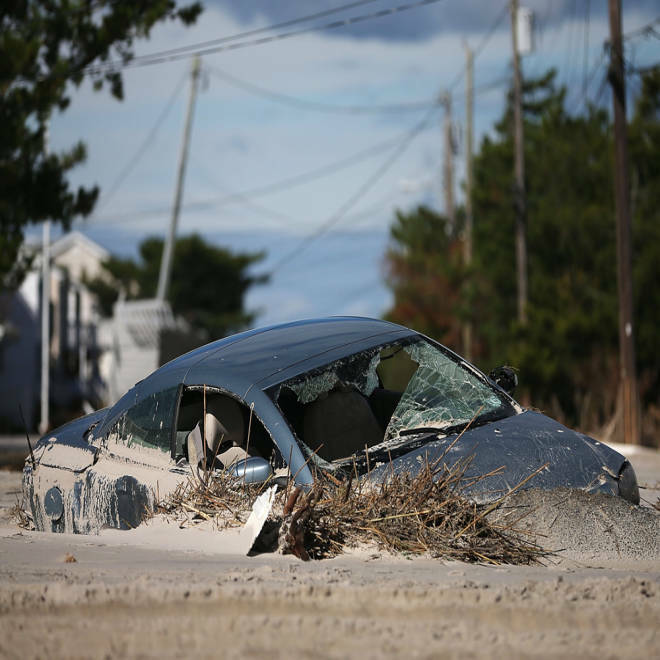 On New York's Long Island, bulldozers scooped sand off streets and tow trucks hauled away destroyed cars, while residents tried to find a way to their homes to restart their lives. In New Jersey, signs of the good life that had defined wealthy shorefront enclaves like Bayhead and Mantoloking lay scattered and broken: $3,000 barbecue grills buried beneath the sand and hot tubs cracked and filled with seawater, the Associated Press reported. Nearly all the homes were seriously damaged, and many had entirely disappeared. Atlantic City's casinos remained closed. Farther north in Hoboken, just across the Hudson River from Manhattan, nearly 20,000 residents remained stranded in their homes, amid accusations that officials have been slow to deliver food and water. One man blew up an air mattress and floated to City Hall, demanding to know why supplies hadn't gotten out, the Associated Press reported. At least one-fourth of the city's residents are flooded and 90 percent are without power.